Day 2, and I managed to sketch the pencils during the team call, and get the inks done at lunch. I visited the Litho Workshop where Scarlett has started an inktober wall, and took the opportunity to nip into the shop and get some more Pigma Microns. Unfortunately I got a bunch of 2mm and 3mm Pigmas, but it turns out they are ok. I'll be a bit more careful and grab some 1mm pens tomorrow. 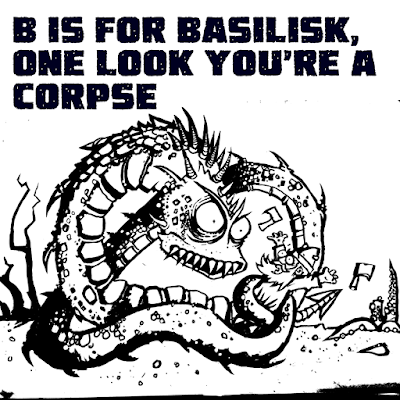 B is for Basilisk, one stare you're a corpse... which sort of scans with the day 1 effort. A is for Axe wielded by dwarves, B is for Basilisk, one stare you'r a corpse.